Leftist Media Strike Force - Klayman: Most Leftist Journalists Are Indeed The "Enemy of the People"! Go to www.FreedomWatchUSA.org to Support Our Leftist Media Strike Force. Also Donate and Share! Klayman: Most Leftist Journalists Are Indeed The "Enemy of the People"! Go to www.FreedomWatchUSA.org to Support Our Leftist Media Strike Force. Also Donate and Share! 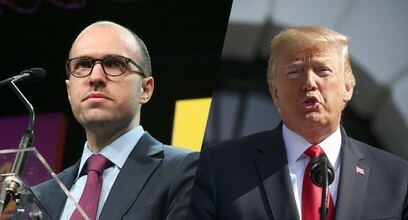 A.G. Sulzberger, the publisher of the New York Times. Trump said he opined that the press has produced "vast amounts of Fake News" and that this was responsible for his decision to label journalists the "enemy of the people." Had a very good and interesting meeting at the White House with A.G. Sulzberger, Publisher of the New York Times. Spent much time talking about the vast amounts of Fake News being put out by the media & how that Fake News has morphed into phrase, "Enemy of the People." Sad!